Nominations and applications are now open for the 2019 brandUP, a free 2-day intensive marketing and communication workshop co-presented with Full Circle Fund. One of last year's nonprofit participants Frailty Myths has now had some time to reflect on the experience, so we sat down to chat with their Co-founder and Director, Erinn Carter, to provide helpful tips to this year's participants. 1. What is Frailty Myths currently focused on as an organization? As an organization entering our third year of operation, we’re working to solidify our foundation as an organization, working to share our vision as to how to change the world with an even larger audience, and discovering new donors to expand our impact to more communities. From an institutional perspective, this means streamlining and defining how we speak about our theory of change, our strategy for creating that change, and discovering new ways to partner and collaborate with other organizations to amplify our mission. We’ve partnered with a number of organization, community groups, and leaders to create dynamic spaces for inspiring our participants to challenge inequality, patriarchy and what exactly a leader “looks like.” From our three part series with community garden Pollinate Farms in the heart of the Fruitvale community in Oakland, CA to our “Lift As We Climb” aerial ballet workshop with internationally renowned Bandaloop performers, Frailty Myths has looked to expand our voice while maintaining a strong connection to our core mission, which is inspiring a new generation of women, trans, and gender nonconforming folks to embrace leadership and smash the myth of frailty. 1. Establishing a voice online in our social media accounts and how we interact with our audience. This includes creating original content, engaging questions from our audience, and engaging with organizations and groups that share our overall mission of empowering marginalized communities around the world. 2. Participating in media opportunities, including podcasts and local media to share our message in new audiences. We worked to create a press release regarding our work and developed a database of outlets that overlap with our mission and began to reach out to them. 3. Streamlining our visitors experience on our website. This meant doing a lot of editing to summarize our mission and also working to envision what the journey that each website visitor may go on, depending on their entry point to our website. 4. We’re celebrating March and “Women’s History Month” by going on a nationwide tour, bringing Frailty Myths workshops to the community in five cities across the United States. We’ve worked over the past few month and leading up to the tour amplifying our mission to new audiences across the country and connecting with allied organizations in different cities. As a new and growing organization, getting an opportunity to get new eyes on our work and our vision was invaluable. We spent so much time as an organization essentially speaking to ourselves; getting an opportunity to get educated and passionate eyes on our product and getting feedback as to how we could make it clearer and more effective was amazing. We changed a number of things after the workshop. We think a lot more now from the perspective of what our participants or outsiders journey may be in experiencing us for the first time. Can we make understanding what we do at Frailty Myths clear, concise, and to the point? What is our theory of change and how can we share that vision with our audience? After the workshop, we made those questions central to our communications mission. 4. Did anything change in your communications and processes from before to after your brandUP experience? How have you integrated the work into your marketing materials and planning? We’ve mentioned some of the specific ways in which we’ve incorporated this work into our marketing materials online with our social media profiles. We’ve also streamlined and focused our filmed marketing materials, including a new commercial advertising our mission and impact. 5. Was there anything that was unexpected or surprised you that came out of the work we did together? I think the continued communication that I’ve had with so many of the people from Rootid and Full Circle Fund after the workshop. The fact that I’ve been able to email and ask questions impressed me so much. There’s a real sense that the folks that have created this program believed in the projects that were selected to be a part of BrandUP, even beyond the few days that we spent together at the workshop. 6. In what ways do you think we can use this process to help organizations like yours further their missions? As a new organization, we’re primarily focused on what we need to improve, how we can streamline established processes and make our own that fit with our goal and how we operate as an organization. As such, we’re pretty focused on what we’re doing wrong. Having this process, which not only helped to highlight what we could do better, but also showed us spaces where we were succeeding, was really inspiring for me. I’d also say that the process of being able to pull back from the day to day grind of operating a new nonprofit to be able to refocus on what we’re doing and why we’re doing was so valuable. Prioritizing the bigger picture of “Why” and what are the larger steps to successfully manifesting our “Why” was really helpful in reminding us of what our process is and why were have dedicated our lives to creating a new space for change to blossom. When I think about BrandUP in terms of the return on the invested time, it’s an impressive experience. Almost more than a year later, we’ve implemented ideas from the workshop into our day to day practice, we’re continuing our relationship with many of the organizations and leaders we met in the workshop, and we’re thinking about ways to use this work in the future. If people are willing to invest the time and effort, the BrandUP experience is definitely worth it. 7. What advice would you give to this next co-hort so that they can be prepared for and get the most out of their experience? The “homework” for the workshop is really important. I know that many organizations like mine are just a few people doing a incredible number of jobs at the same time. But taking the time before the workshop to think about different donors and their specific donor journey, solidifying your theory of change, and connecting with each staff member that will participate at the workshop beforehand feels paramount to getting the most out of the workshop. With so little time to think about really dynamic questions, you’ll want to spend as much time being able to think about new ideas and new strategies, not questions about the direction of your work or your foundation vision. Want to learn more? Read about our 2017 BrandUP Awardee Root & Rebound. Few great things in the world were created without first planning, then measuring. So, why is your nonprofit any different? All too often, it's hard to know what should be measured and what should not be. What is really important for your nonprofit to measure? Tools like Google Analytics and other data sources have so many reports and data fields. How do we know what's meaningful? The good news is that if you are reading this article, you’re headed in the right direction - you see measurement and data as a valuable tool to make informed decisions and tell your impact story. This post will walk you through the process of building a measurement plan that’s specific to your nonprofit. It will help you choose the data and reporting that’s important to monitor so you can become a more data-driven nonprofit. Many nonprofits get caught up in metrics that aren’t as important as they think. Especially when it comes to their website. Too often we’ve had clients only monitor the number of page visits and bounce rate of their site to measure success. These metrics can be important, but only in context of your broader goals. If you goal is to raise $100,000 through your website, wouldn’t you want to track the money coming in instead of the page visits? The same is true if your nonprofit goal is to recruit more volunteers, members or acquire more donors. I often think that organizations fall in love with these headline metrics because they’re not sure what else to measure. And, they like the big numbers! Luckily, we’re here to help your team get out of that habit. The best way to establish a good measurement plan is to start at the end result and work backwards. Using a nonprofit logic model can be a powerful tool to provide structure to your business goals and define your measurement needs. To summarize how this works, let’s look at an example from the logic model post that we linked to above. EXAMPLE ORGANIZATION (We made this up): Clean-up And Restoration Team (CART) is a volunteer-driven environmental clean-up and restoration organization that uses volunteer labor to clean-up locations that have been left polluted by industrial companies. With volunteer crews they clean-up these locations and restore them using native species of plants. You can see how the outcomes and outputs relate below. Outputs are what we want to measure. Outputs represent the things that your business needs to generate on your website and other marketing channels to generate the outcomes you want to create. Write down the outputs you need. These are going to be one set of KPI’s that we want to record. Don't forget that outcomes should be measured as well. These often tell the best story. For CART, they could measure the number of acres of restored Habitat. They could also measure the the miles of streams that have been affected by the land clean-up. Sometimes these larger numbers can be more difficult to come by, so make sure that you're recording these project successes somewhere. They tell a great story! With any business goal, there will be actions that individuals take that relate to your activities and key outputs, and there will be actions that people take that represent a step towards that ultimate outcome. For instance, with CART one of their key activities is recruiting volunteers. However, they also know from analyzing their data, that one out of five individuals that signs-up for their enewsletter on their website will eventually become a volunteer. So, you could see why they want to measure both, right? These are referred to macro-conversions and micro-conversions. Macro-conversions have direct impact on your business goals. Micro-conversions may lead to an eventual macro-conversion. You can see how these micro-conversions are indicators of opportunities that could turn into macro-conversions. But, these two are necessarily not directly related. Once you have established your micro- and macro-conversions, it’s time to create the conversion goals in Google Analytics. If you haven’t already, setting up Google Analytics goals in your account is a must. Remember at the beginning when we said that we should ignore the headline metrics? That’s because goals are the bread and butter of your organization’s success. So, we need to set them up. 1. Assign a Value to Macro-Conversions: Even if you don’t think your conversion has an explicit dollar value, it’s important to think hard about this. In the case of CART, you may assume that volunteers have no value. They do! How many hours is a volunteer shift? Multiply that by the amount you might pay a laborer to do that work. That’s the value of a volunteer sign-up. Once you start to see this value, you will start to understand that your marketing efforts are generating value for the company. And, if you are advertising, you’ll be able to establish return on investment (ROI) on your ad spend. 2. Use Campaign Tracking in Your External Marketing Channels: Google has a nifty feature called campaign tracking, or UTM tags. This allows you to add pieces of data into links that you use in social media, emails, or anywhere that give rich insight into where your conversions are coming from. By parsing out your marketing efforts, you will have real visibility into which marketing channel and effort is helping you generate the outputs your company needs. This allows you to focus your efforts and prioritize your work. There are lots of tools and best practices that will help you implement this at your organization to become a more data-driven nonprofit. Why is Data Important for Marketing and Communications? Too often we think of data as being internal facing. It helps us make decisions about the effectiveness of our programs. It influences budgeting and business decisions. The truth is that data is also critical to your outward facing communications, and telling your impact story. All nonprofits have a vision for how they will affect the world. That vision is what will initially attract your supporters - it's the "why" that gets them hooked on your mission. But, showing impact is what will keep funders and supporters coming back time after time. It's great to have an inspirational story, but if you want to scale your impact, you need to show funders and supporters that you're work is making a difference at a larger level. Data tells that story. In 2018, CART empowered community volunteers to restore abandoned industrial waste sites and helped restore the quality of our drinking water. This is fine, but relies on the anecdotal. Were there just 10 volunteers? Did they only do one project? If so, that's not really that impressive. There's no expression of real imact here. In 2018, CART empowered 20,000 community volunteers to restore more than 1,200 square miles of abandoned industrial waste sites (that’s the size of Rhode Island!) and helped restore the quality of our drinking water to over a million people! Not only does measurement tell the impact story better, it also shows funders and supporters that your organization is sophisticated enough to be able to measure. It shows them that you're taking a methodical and calculated approach to your mission. If you can then back-up this measurement with a great story, then you have a winning communications formula. 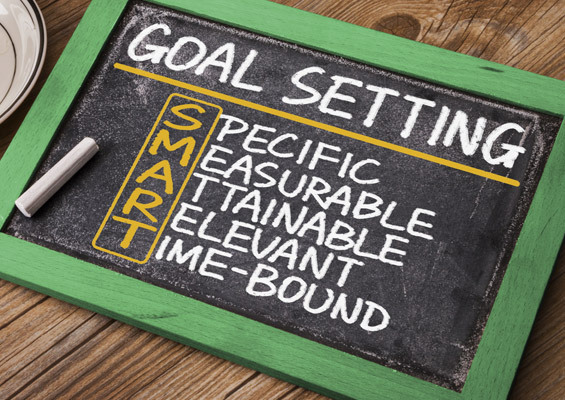 Now that you understand the process of turning business goals into measurable outputs. How do we make this matter on a day-to-day basis? This is a tough question. Establishing a culture of data is not something that happens overnight. There are key elements to help your organization make this transition. The role of data should be recognized at every level of your organization. And, the access to data needs to be democratized. If you have a data analyst at your organization, then you can’t expect them to be the gatekeeper to all data. Leaders, directors, managers and interns all need to be able to make decisions around data. Once everyone is onboard, carve out time at your department and staff meetings to talk about what you’re seeing in your data. When everyone has access to the data, decision making processes should follow similar models to what we’ve talked about above. What are the outcomes we want? What are the outputs needed for that? What are the inputs needed to get there? How do we expect that to show in the data we currently have? By starting with an outcome and then building a strategy, you can track your efforts more closely. Don’t be afraid to fail! Rather than putting your head in the sand if the data shows that your efforts didn’t pan out, use the data to figure out why it didn’t turn out. Refine your approach and try again. Madness is doing the same thing over and over again expecting a different result. Data helps us do things differently. In order to put the power of data in everyone’s hands, it’s important to build tools that they can use on their own. Luckily, Google Analytics allows you to build dashboards that anyone on your team can access. It also allows you to automatically email these on a regular basis to the whole team. This gives everyone direct access to the latest information. The second option is using Google Data Studio. In addition to pulling in GA data, Google Data Studio will allow you to pull in data from a number of different services like email services providers and social media platforms. It can serve as your central data dashboard. Check out Rootid’s nonprofit Google Data Studio dashboard template that you can use to get started. I get it. There are million things going on at your organization, and this may not be top of your list. However, it’s important to take the first step in this process. Bring it up at your next meeting, or frame your next conversation with your team based on data that you see taking place on the website. Framing your conversation in this way may spark a larger conversation around our biases to make decisions based on gut and not proof. That can be a powerful place to start. The need to boost donor retention is necessary to keep your nonprofit organization up and running. This is one fact we can’t ignore. Cultivating a strong and lasting relationship with donors proves valuable for nonprofit organizations in acquiring funds and creating a community of supporters. There are several ways nonprofits can increase donor retention and one of those is by optimizing the power of email marketing automation. But before we delve deeper into how you can implement automated welcome emails, let’s first run through on the foundational pieces. Email marketing is critical to the success of nonprofit fundraising. Given its effectiveness in generating ROI, email marketing is an important channel of communication for nonprofits to connect and engage with donors and supporters. In contrast to other channels, email marketing is inexpensive, and more and more donors are growing comfortable with completing donations online. Communication is of high importance for nonprofits. Email marketing lets your organization thank donors, entice more volunteers to join, and spread your mission to a wider audience with ease through tailored, auto-generated emails. This way, you can focus more on your goals and less on online engagement. The importance of increasing donor retention in your organization. Acquiring first-time donors is both time-consuming and expensive. Therefore, cultivating relationships with existing donors is essential in keeping them more involved with and connected to your mission. A recent study showed that only 46% of donors have given to the same organization two years in a row - a figure that signifies there’s more room to level up your donor retention strategy and bring in more funds down the line. If you focus more of your efforts on a strong retention program, you spend fewer resources, gain more sustainable funding, and can increase your organizational productivity. Boost your donor retention with email marketing automation. We’ve said it before and we’ll say it again: email marketing is one of the most effective methods in generating ROI, as well as connecting and engaging your organization with the right audience. Email marketing helps you build and nurture genuine, two-way relationships with your donors. How do you make it work for your organization? Optimizing email marketing by using automated email series as part of your donor retention strategy holds the key to increasing the number on your donor’s list. Automated email series can help increase your donor retention. Suppose you have new supporters who just donated. The first thing you would want to do is to make them feel welcome right away. How do you do this? By sending a series of automated welcome emails. The first few messages you send to your new contacts are crucial because one, it sets expectations about your organization and two, it paves the way in keeping your donors committed to the cause. The beauty of automated emails is that you don’t have to do it manually, thus saving precious staff bandwidth. You only have to set the stage once, key in certain user actions (or triggers), and the relevant email will automatically send once a contact has taken action. Think of it like having a direct dialogue with both your current and prospective donors at the right moments. By now you might want to start rolling out your automated welcome email series. But first, you should know what to send. You should send the first email immediately - after they sign up or donate - or within 48 hours the latest. It’s clear what this email should be about, which is to welcome and thank the donor for their gift. This email is also a good way to reinforce the fact that their donation is helping your nonprofit make an impact. Give your donors the opportunity to get to know more about your organization, its mission, and current and planned activities. Showcase the impact of their donation on your efforts through interesting information about your work. It’s important to let your donors know what their gift is making possible. It opens an opportunity to further inform your donors of the kind of work you’re doing and how their donation helps. You can also ask your donors a question or invite them to follow you on social media. Sending follow up emails can go a long way in establishing loyalty and support for your organization. This email by charity:water is a perfect example of an email that informs and engages with the recipient. Nothing gets someone’s attention or interest better than a good story. Share compelling stories you’ve encountered along the way, stories of people whose lives were changed, stories of how your team works to achieve your organization’s goal. Show your supporters your progress and accomplishments made possible with their help. Share your success with them. After some weeks of connecting and engaging with your donors, it’s time to present them with other opportunities to engage. You can invite them to your events, inform them of different volunteer work, or open the opportunity to donate again. Invite them to be more involved and engaged. Doing so makes them feel that they’re part of your mission and your work. Just don’t spam them with donation appeals. You wouldn’t want to give them the impression that it’s all about getting a donation. The one thing to keep in mind when doing your automated welcome series is to make it personal. Your welcome emails should be short, sweet and interesting to keep your donors engaged. Before you start planning your welcome email series, come up with a checklist of the important things to do and consider first. Below are some key ways to optimize your automated welcome emails to further increase your donor retention. Not everyone in your list has the same motive when they give. Their first moment of contact with your organization, as well as their interests and attributes, vary. Use segmentation to send the right email to the right person at the right time. If you segment your nonprofit’s list, you get to deliver relevant content and reach more donors effectively. Aside from using segmentation and creating a compelling subject line to grab your donor’s interest, you can go deeper by understanding their motivations and priorities in joining your cause. This study will help you identify five main reasons people give - also known by the acronym T.A.S.T.E. Trust. Emphasize the idea among your donors that your nonprofit will make the best use of the resources they gave. You can reinforce this in your subject line emails to start with. Altruism. An altruistic concern for the wellbeing of others may be the most powerful reason that compels people to donate or volunteer. You can include photos of your nonprofit’s actual work in your welcome email series. Social. One of the motivating factors for donors to give is when a loved one cares about or is involved in the cause. Use testimonials or stories from your staff, volunteers, or people you’ve helped to emphasize the impact of their donation. Taxes. Charitable gifts often qualify for tax deductions so consider stressing this point as you approach the end of the year. Create targeted campaigns around the holiday season to generate awareness and drive donations. Egoism. This refers to the positive feelings that linger on people when they display charitable behavior. Make your donors feel like they’ve done a good deed in your welcome email series. 3. Optimize your welcome email campaigns. Test and review what works for your emails and then use the results to improve your fundraising campaigns. It’s important to personalize your nonprofit’s message and segment your audiences. But remember, the more personalized your emails are, the more likely donors are to respond. This goes without saying that you must respond to their feedback. Don’t make your donors feel like they’re being ignored. 4. Send different types of content. Don’t just ask for donations. Raising funds might be the biggest challenge most charities face, but it’s not ideal when people associate your emails with an ask. You can create and send different types of content that cover a variety of topics - expressing gratitude to donors, telling specific stories with emotions, showing the effects of their donation, inviting them to be involved, and so on. The Canadian Red Cross informs their audience about the many ways data and tech can make it easier to help those in need. At the same time it also encourages their audience to like, follow and engage with their social channels. Understanding the value of donor retention and how email marketing can boost it helps you come up with a strong retention strategy that will grow and maintain your list of supporters. Setting up and sending automated welcome emails lets you cultivate and nurture the early stages of your relationship with donors, which will then lead to a strong belief and loyalty in your organization. Email marketing is one of the most powerful marketing channels that nonprofits have at their disposal. According to research, the amount of revenue generated by nonprofits through email marketing continues to grow. In 2017, email donations increased by a strong 23%! At the same time, our supporters are more bombarded with email than ever before. As a result email open rates and click through rates (CTR), have dropped dramatically over the last 5 years. According to the MailChimp benchmark report, the average email open rate for nonprofit is only 24.11%. The same report shows that the average email click through rate is just 2.57%. To put it another way, 97.43% of people on your list will not take action when you send them an email. Ouch! The good news is there are specific strategies to overcome these problems. What is a Click Through Rate (CTR)? Measuring your marketing efforts is the most important thing you can do in order to get better and more efficient. Click through rate, is one of the most important things to be measuring. Put simply, if you send an email to 100 people, and 10 people click on a link in that email, you will have a Click Through Rate, or CTR, of 10%. Why is Click Through Rate so important? To understand the importance of CTR, let’s look a fictious example. Let’s say our nonprofit is looking to raise a $10,000 online. If you send an email to 2,000 supporters and you get a CTR of 5%, 100 people will donate as a result of that email. Let’s assume that everyone that clicks also donates (this is not usually the case and an effective donation page has a huge influence on this, but for the sake of example, we’ll keep it simple...). For this example, each user donates $50. This campaign would gross $5,000. Now, let’s say that same email campaign, was able to achieve a CTR of 10% instead of 5%. This time 200 people donate. Again, or average donation is $50. This time we met our goals of $10,000. We doubled our revenue by simply increasing our CTR. So, you can now see why as marketers and fundraisers we should be so focused on our CTR. So, you've built a email marketing list for your nonprofit. But, how do you get people to take action? The most powerful lever that you have as a marketer to drive action is your understanding of your audience. Most nonprofits have several distinct personas that they are speaking to. Each persona, or audience has a motivation, or topic of interest that originally brought them to your organization. You need to know what that motivation is, and leverage it in your email marketing. First, it’s important to capture their motivation when they initially sign-up for your email list. You can use email marketing automation to capture this information, or use checkboxes on your sign-up form to capture this. Second, you could use stakeholder interviews or surveys to help generate supporter profiles. Once you capture this information, use it to segment your email lists based on those motivations or interests. Most Email Service Providers (ESP's) or CRM’s will allow you to tag your constituents with this information. Once segmented, use this knowledge to your advantage. If you know a donor is motivated by your work saving the polar bears, frame your email to them using that motivation. If you can identify several different areas to segment your donors, then use those segments to develop your email campaigns, your CTR will increase dramatically. Your first battle in email marketing is to get the user to open the email. If they open your email, then they're one step closer to clicking on your email content. It sounds simple, but it’s not as simple as you think. As we said at the beginning, nonprofit industry average for email open rates is just 24.11%. Here are a few tips to constructing a better subject line to beat that average. There is a fine line here, but it’s important to get this right. You can put supporters off quickly if you sound pushy or like we’re hustling them. Once you've got your audience to open the email, how do we improve the clicks? Here are a few tactics. Leave a Little Mystery - Don't tell the user the entire story. Leave something that they need to click through to find out more. If you're showcasing how one of your programs changed a client's life, setup the problem they face, but don't reveal the struggle to victory. Use the copy, or better yet video, on your website to tell the rest of the story. Users are more likely to click through if they don't have all of the information yet. Make them want to click through! Keep Your Copy Focused - Don't write a novel. People today are distracted (squirrel! ), and they don't have a lot of time. Keep the email copy to no more than 3 paragraphs. And, a paragraph should be 2-3 short sentences max. Focus on Audience Motivations - We mentioned that segmentation is a powerful tool. Make sure you're using your understanding of users to craft copy that specific to them. Don't send the same email to your entire list. Segment your list by motivation, and craft your copy based around this. For instance, if you have a program that saves the polar bears, and you have a donor segment that love polar bears, send them an email with copy specific to your polar bear program, not your marsh restoration program. Use Buttons for Call To Actions - Most ESP's provide an option in their editing interface to add call to action buttons in your copy. There's a reason for this. They're WAY more effective in driving action. According to a test that CampaignMonitor performed, they increased their email click-through-rate by 127% by including a button at the bottom of one of their emails. Wow! If you’re not testing your marketing content, you’ll never get better. Most Email Service Providers (ESP’s) have the capability to A/B test your email content. This could be the subject line, content, or “from” field. If you’re not using this, you need to be. No one knows your audiences better than you. So, being able to test subject lines and email content will continue to improve your open rates and CTR over time. Once you’re committed to testing you’ll be amazed what you can learn. During each campaign, take time to think about what strategy you’re going to leverage in your email – think about what we talked about in the subject line section. Be intentional about your subject line and content. Make sure that you record the subject lines and content that you’ve used on emails over time. Then record your open rates, and CTR’s for each campaign. After 8-10 campaigns you’re going to start seeing trends based on what type of content performs better. Use that information to continue to improve your content. Over time, you’ll be amazed to see how your online fundraising and email campaign improve. Example: Facebook, in partnership with Paypal, matched donations to US-based nonprofits (up to $7 million) on #GivingTuesday. Organizations using Facebook’s ‘Charitable Giving Tools’ paid no fees and were treated to new features, such as recurring donations and updated reporting. By leveraging the social media giant’s offer, nonprofits raised over $125 million. Example: BarkBox, a canine-centric subscription service, made their followers a simple but powerful offer on #GivingTuesday: For every new subscription, they would donate a BarkBox to a rescue/shelter pup in need. To emphasize this opportunity, they added a video of homeless dogs receiving new treats and toys. Needless to say, hearts melted and wallets opened. 3. They joined forces with likeminded partners. Example: Normally, a dollar donated to Feeding America provides at least 10 meals to families in need—but on #GivingTuesday? The Kroger Co. Foundation stepped in to double the impact in support of their Zero Hunger | Zero Waste program. That makes at least 20 meals provided for every dollar raised! 2. They teamed up with influencers. Example: HGTV superstars Drew and Jonathan Scott—in partnership with Lyft and Nissan—marked #GivingTuesday by taking their celebrity friends for a spin in Habitat for Humanity’s cleverly branded vehicle. The ‘Give Habitat a Lift’ campaign tapped into the popularity of in-car videos as celebs discussed what home means to them and the importance of Habitat’s mission. Example: Just in time for #GivingTuesday, World Vision introduced a new, interactive pop-up shop in New York's Bryant Park. Activities like pictures with a goat, a working water pump, and an African virtual reality experience allowed families to see and feel the mission firsthand. They were then invited to shop for gifts that give back, with all proceeds going to benefit people served by World Vision around the world. #GivingTuesday is all about finding fun ways to collaborate for the greater good. If you can harness that spirit of giving, you can meet (and surpass!) any fundraising goal. If you spotted a great campaign you think should be on this list, let us know on Facebook! 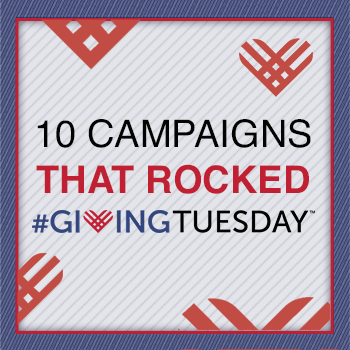 For more inspiration, check out our post highlighting ten brands that rocked #GivingTuesday. Then, when you’re ready to start working on your own campaign, drop us a line.